Travel for food is my passion and people with similarmindset joined hands together to explore the Hassan City. Precisely, it was animpromptu visit to explore some hidden gem kind of eateries in Hassan. I have been seeing the breakfast at Hassan in various social media platforms and trust me, those are instagrammable ones. Its always to pleasure to visit oldest eateries which is nostalgic for me. Since I bought up visiting those eateries with my grandfather. What is so special about the eateries in Hassan? Unlike Bangalore, most of the eateries which I visited will remain open throughout the day and the charm has not lost with respect to tables, cutlery, wooden windows, those benches, dark walls in kitchen. Precisely old school type culture. People are so sweet to guide every possible way. We have started from Bangalore at 5.45am and our first pit stop was at Swati Delicacy in Mangalore Highway for coffee. The place offers pretty decent south Indian food; I would say its a safe bet on highway. After our coffee, we did reach Hassan around 8.30am! Where did we go for breakfast? Our first pit stop was at Mamu Idly Hotel. Its located on the by lanes of Hassan and one of the very popular eateries. If you are going in car, I would suggest parking in the main road and take a 2 minutes walk to eatery. We have ordered Idly and Doe-sae. They serve food on plantain leaf, which is feel good factor. 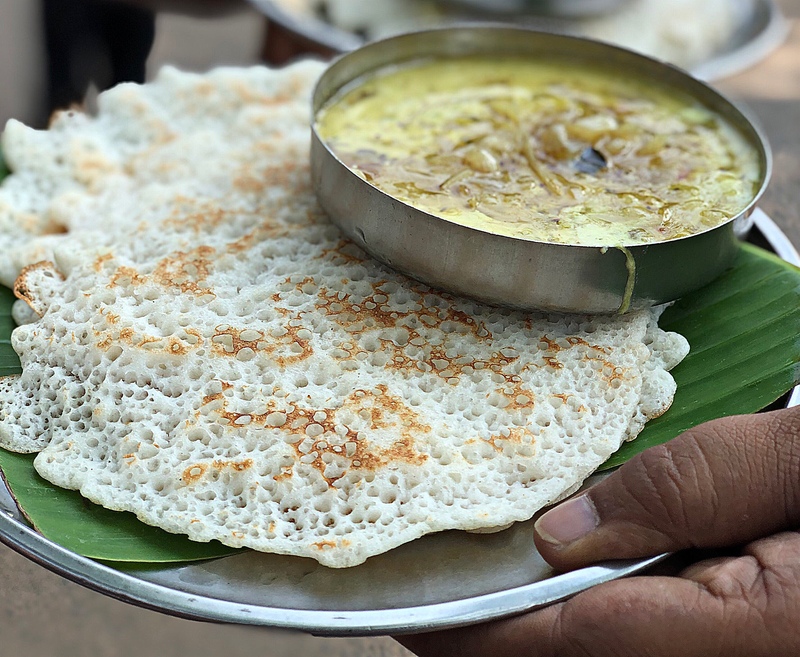 The Idlys are spongy with milky white texture and the beauty is that, Idly served with spicy redchilli chutney topped with sautéed onions and Ghee. Whereas, Khali Doe-sae is superb and liked it more than Idly as the Doe-sae roasted both the sides in ghee which forms golden brown texture. Next we did go to a place by name, Venkatesh Canteen (2ndPit Stop), which is endorsed by most of the foodies in Hassan. However, theplace was shut on the day we went due to some circumstances. We really missed it and disappointed too. Gajanana Refreshments is another legendary eatery for Thuppa Set and Benne Masale Doe-sae, we got a great welcome from the owner after knowing the fact that, we came only to explore food at Hassan. It is hard to get table especially on weekends. I suggest you to sit wherever you find a chair. Thuppa Set Doe-sae – The Doe-sae is thick and roasted perfectly, which is just melts in mouth. The accompaniment Chutney topped with onions & ghee is just out of the world. Doe-sae with Chutney over here is absolute bliss for every doe-sae lover. A must try dish! Benne Masale Doe-sae – The Masale Doe-sae over here has dark golden brown texture and made with extra portion of buffalo butter. The Doe-sae has nice glossy texture, which is topped again with dollop of white butter and tastes extraordinary. However, the plain watery chutney disappointed me. They do serve Pulao, which can be skipped. Overall, its a must try restaurant in Hassan. Mothi Hotel, a decent south Indian restaurant located right opposite to the KSRTC Bus Stand. I was told to try out their signature Ghee Rava Doe-sae. I somehow had mixed opinion about the Rava Doe-sae here as I have had the better ones in Bangalore. However, others may love it looking at the number of doe-sae’s ordered by the locals. The final pit stop was at HVR Hotel. We have kept this placelast since we have had the HVR breakfast in Bangalore. Yes, they have a branchin Bangalore at Sheshadripuram. We have ordered Set Khali Doe-sae, ButterMasale Doe-sae and Pudi Masale Doe-sae. All the 3 were extremely good. However,my vote is for both Mamu & Gajanana. I would like to thank Srinidhi Hebbur and Whole Gang of Bangalore Breakfast Walks for making this breakfast meet happen and special thanks Hassan Foodies for being with us throughout the day. I have not added the address as most of these places areavailable on Google Maps and also, one can take help from locals.